When I think of the word abundance, my mind goes almost immediately to one of my favorite family fall traditions: Apple picking. 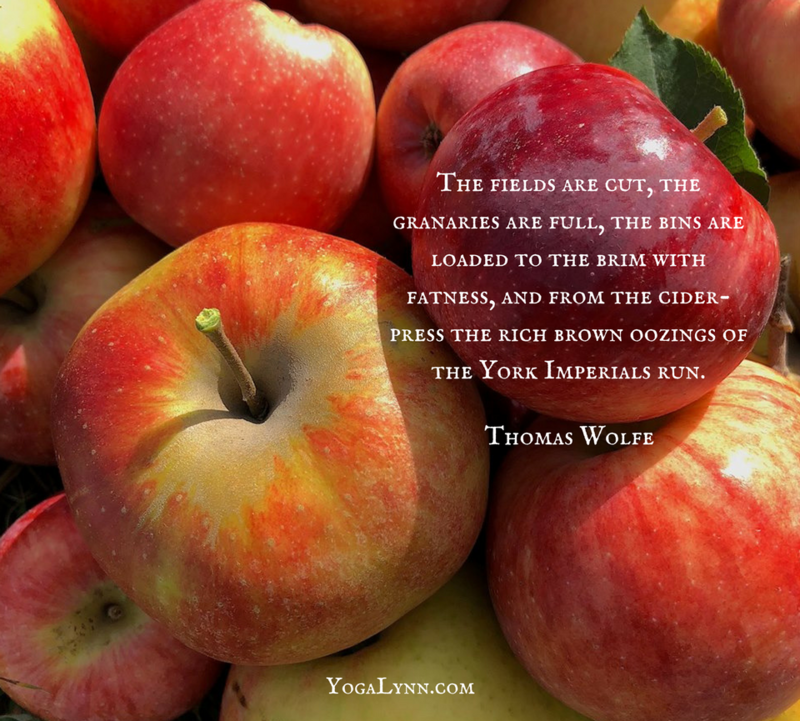 Once a year, my daughter and I load up the car with snacks, water, and a friend or two, and head north in search of our annual fix of orchard-fresh apples. Highlights of the trip typically begin as soon as we leave the city. We opt for scenic routes that afford us a panoramic view of nature in full flower. Colorful trees preparing for winter hibernation are offset against a brilliant, blue sky. We take note of the fresh produce stands and farmers markets along the way. That way, we know we’ll return home laden with fat pumpkins, vibrant veggies, and free-range eggs. At the orchard we fill our sacks with different varieties and compare notes on the fragrant goodies–slow-cooked applesauce, oatmeal-topped crisps, and cinnamon-scented pies–we’ll soon be whipping up. The whole day is a delicious reminder of the multitude of blessings in my life. This year, something seemed a bit off. Travel and work schedules delayed our excursion by several weeks, the consequence of which became evident from the start. The late autumn sky was overcast and a bit grey. The trees were past prime. Colors that usually resemble a new box of crayons on the first day of school were faded. Vivid reds, bright yellows, and brilliant oranges had given way to muted rusts and golds. Many trees had already divested themselves of leaves. Our late timing was apparent at the orchard as well. We knew going in that the last of the 18 varieties at our orchard had peaked two weeks earlier. Still, it was a bit disappointing to see that many trees had been picked clean. While we were still able to fill our sacks, there were plenty of rows in which more apples lie on the ground than hung on branches. For a moment I experienced a twinge of regret over what we’d missed. Those apples on the ground are what woke me up. 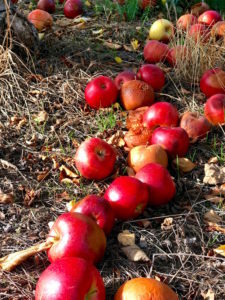 As I pondered the piles of apples in various states of decay, I began to see the whole cycle of life on this orchard. I knew from the literature that the orchard would be collecting all of the fallen apples. Some would feed the livestock, the rest would return to the earth in the form of rich, organic compost that would nourish the earth for future harvests. What I initially saw as decay was actually going to sustain life. In fact, it was a harbinger of spring growth. This was the very heart of abundance! On the drive home, I reconsidered the colors. While the sky was grey, it was a beautiful day, glorious in fact. The air was fragrant, crisp, and cool. The declining colors produced a beautiful tapestry of subtle shades. The afternoon sun shone through them, casting a golden, almost fairy-tale like glow. As to the limited variety of apple pickings compared to years past, my misdirected sense of loss was evident as soon as I looked into the ones I had collected. Dumping them on the ground to shoot the picture you see, revealed a sun-kissed collection of juicy, delicious fruit. And we did return with purple eggplants, vivid red tomatoes, and free-range eggs–blue ones, in fact! Most important of all, my daughter and I created a splendid memory as we spent time together chatting, laughing and mugging for selfies among the branches. In short, there was nothing wrong with this glorious day save my very narrow framing of it. In retrospect, this was in every sense of the word, abundance personified. Thanks for your personal reflection that is apt for all of us. Miss you. Thanks, Mary. Miss you, too! This was a lovely read and your thoughts hit home, particularly at this point in life. You have always been a very special woman, but your observational insight and soul came out in your writing. You made me hungry for everything made with apples. BTW, you must have a terrific relationship with your daughter….so special. Fondly…. Hey Gary, Thanks for your generous words. It’s been too long. We must connect.